Photos by Forrest Anderson, unless otherwise designated. Eat it, build a home and furniture with it, outfit your kitchen with it, use it for plumbing, wear it, make fences or storage containers with it. It’s biodegradable and when you chop down a forest of it, it just springs back. It grows on rain water, runoff or spring water and it’s harder to kill than to get to grow. If you cut one down, it will sprout new plants that reach their maximum size within 6-90 days and can be harvested within 3-6 years. A Bamboo forest in Kyoto, Japan. A bamboo shoot in the Imperial Gardens in Tokyo, Japan. It’s not surprising that for thousands of years, bamboo has been considered a magical plant. It is one of the most useful and sustainable materials on the planet, strong, versatile and inexpensive. Bamboo grows on every continent in tropical to sub-temperate climates, creating a bamboo belt around the earth within which bamboo can easily be grown, harvested and processed locally. With new technology such as processing bamboo into textiles and treating it so it is an insect-proof building material, it has become even more useful. It’s less expensive for most of its uses than alternative materials. Bamboo is the largest of the evergreen grasses, not a tree, and is one of the fastest-growing plants in the world. Some species of bamboo can grow an inch every 40 minutes. It has 1,250 species, many of which are particularly well-adapted for specific uses. Some varieties grow so quickly that they are banned in some areas as invasive species. This photo and the next are of two very different species of bamboo. 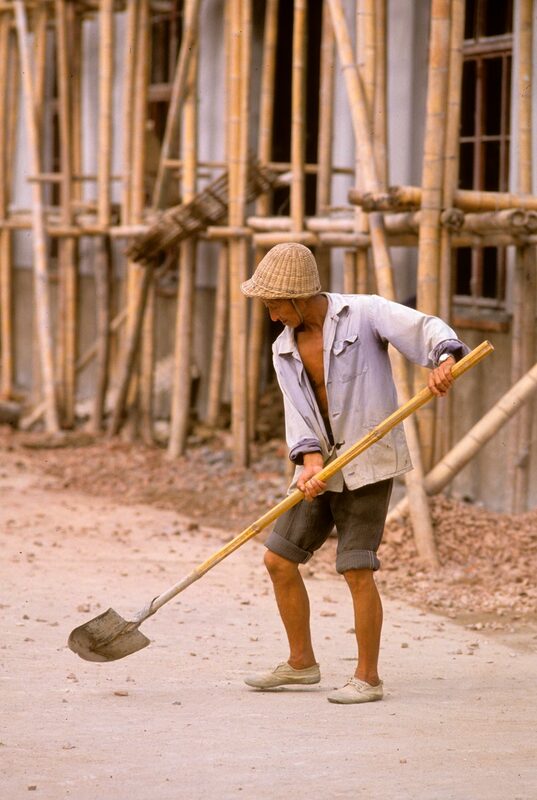 This man, who is wearing a bamboo hard hat and using a shovel with a bamboo handle, stands in front of bamboo scaffolding used on a construction project in Wuxi, China. A billion people in the world live in bamboo houses, including 70 percent of Bangladesh’s population. 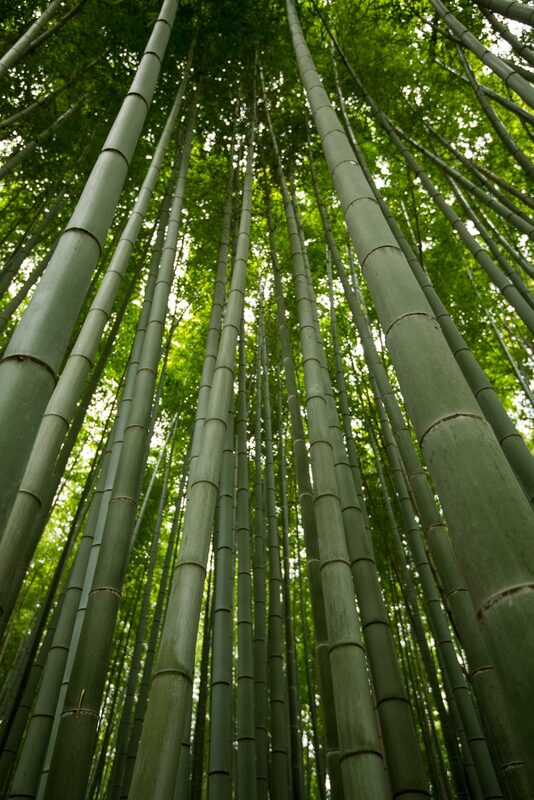 Bamboo is as strong as wood and equal or better than steel in tensile strength. When it breaks, unlike wood, it first cracks so that people have time to get out from under it. It can withstand an earthquake up to 7.6 magnitude on the Richter scale. Traditional bamboo craftsmen created fine buildings that set a high standard for design, such as this ceiling at the imperial retreat Katsura Villa in Kyoto, Japan. Bamboo can be used in its original pole shape or, for standardized building, processed into panels, boards and beams on an industrial scale. The panels resolve the problem of bamboo poles being non-standard in size. Bamboo can be processed into a wide range of building products from inexpensive to high-end ones. The sustainable building industry is looking carefully at bamboo as a way to save traditional timber forests and lower the environmental impact of building masonry homes, as bamboo processing takes only an eighth of the energy it takes to process concrete and a 50th of the energy it takes to process steel. Over all, bamboo houses can be built at 40 percent less environmental impact than masonry houses. They also are 60 percent cheaper than wooden homes, opening up possibilities for more affordable housing. 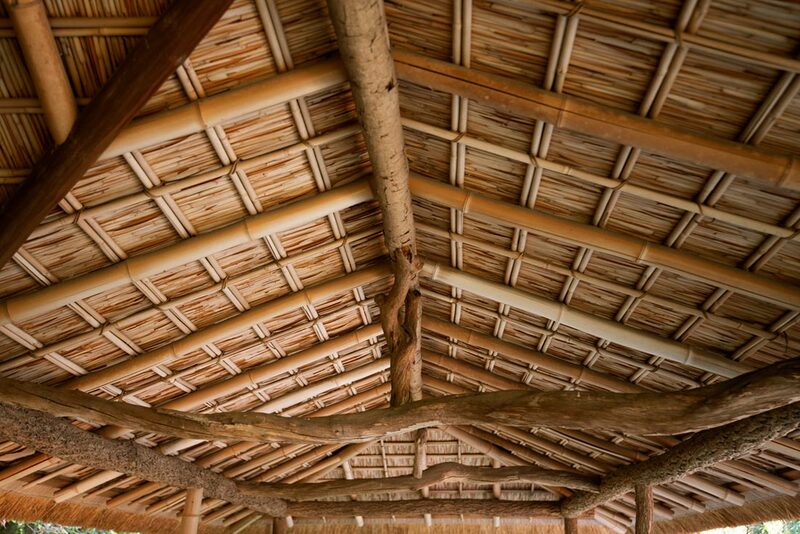 Bamboo used for construction must be treated for insects so that a bamboo house can last as long as a wooden house. The usual method is to treat it with borax and boric acid. Sometimes cut bamboo is boiled to remove starches that insects eat. Bamboo has been used as a construction material in South Asia, East Asia, the South Pacific, and Central and South America for centuries and is used globally today. It has also long been used as scaffolding on construction sites in Asia. In China and India, cables made of bamboo have been used to hold up suspension bridges for more than a millennia. 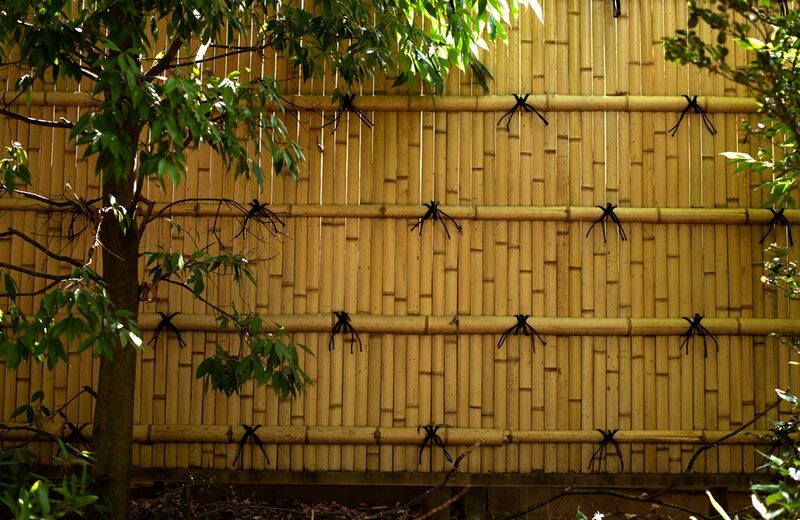 In Japanese architecture, bamboo is primarily used for fencing, grates, gutters and as a decorative element. A bamboo fence in Japan. Bamboo can be trained into different structural shapes such as squares and arches while it is still growing. The cost of doing so is much lower than obtaining the same shape with wood timbers. Cut stalks can be curved or flattened by applying heat and pressure. Because bamboo floats, it can even be tied together to support floating houses. It can be laminated into sheets and planks by planing it flat, boiling it and then drying it in strips which then are glued, pressed and finished. Bamboo laminate products such as flooring, cabinetry and furniture were developed in the mid-1990s and now are a $30 billion global industry. The highest quality bamboo products are three times harder than oak. A number of institutes and businesses are researching further uses of bamboo as an ecologically friendly construction material and ISO standards have been created for it as a construction material. In the United States and France, it is possible to buy bamboo houses that are earthquake and cyclone-resistant and internationally certified. 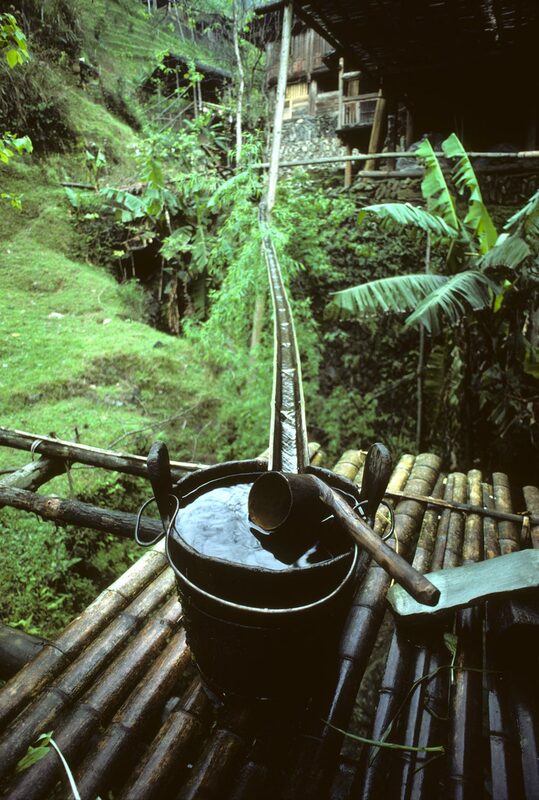 Long bamboo pipes are used in some places to transport water down mountains from springs. Bamboo pipe used to transport water from high on a mountain to a kitchen porch made of bamboo, Peace Village, Guangxi, China. Bamboo plays an important role in sects of Buddhism which forbid the eating of animals and eggs. The bamboo shoot, a nutritious alternative, is a staple of Asian cuisine. Bamboo shoots, which produce cyanide, are processed to make them edible in both fresh and canned form. They are uaed in stir fried and fried dishes. and also are eaten fermented and pickled. Some cultures make soft drinks out of bamboo. Bamboo leaves are used as wrappers for steamed dumplings. Soups are made with bamboo shoots, and rice is cooked in hollow bamboo stalks over flames. Bamboo leaves also are fed to livestock and eaten by a variety of animals, the most famous of which is the giant panda. Elephants and gorillas in Africa also eat bamboo. 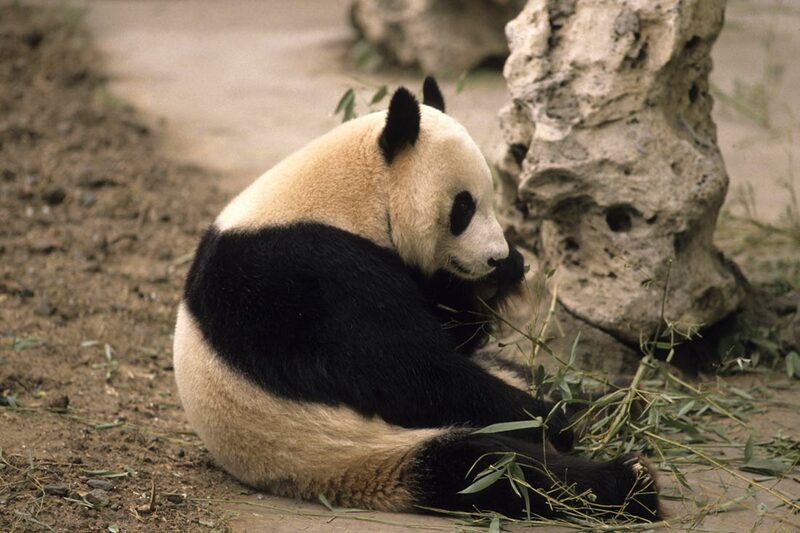 A giant panda munching on bamboo at the Beijing Zoo in China. New manufacturing processes have made it possible to transform bamboo into an ultrasoft fabric. The process starts with harvesting two-year-old bamboo, then chopping it into chips. Those are soaked in an environmentally friendly solution that breaks down the fibers. This pulp is dried and then turned into parchment, ground and spun into a soft material called bamboo fiber which is spun into thread. The cloth from which it is made is softer than cotton, has a silk-like drape and can be made into products ranging from t-shirts to bed sheets. It is naturally thermo regulated, keeping the body cool in summer and warm in the cold. It wicks moisture away from the body. Bamboo fabric is made into shirts, pants, hats, socks, baby clothes and bedding. Its manufacture is not entirely environmentally friendly. It requires bleaching and cooking it in a caustic lye solvent that can be toxic for workers and can pollute the environment. However, it still has much lower environmental impact than conventional cotton, which is laden with pesticides and petroleum-derived nylon and polyester synthetic fabrics. In some areas, looms are made of bamboo as are hand spinning machines and other tools for textile manufacture. Paper and writing instruments - In ancient China, strips of bamboo were bound together with string and written on in vertical rows as early as 1250 B.C. They were replaced by paper by the 4th century. Today, bamboo is used for paper making in China and in India, a country where 60 percent of the paper is made from bamboo. The paper ranges from high quality to coarse paper money that is burned to honor ancestors at Chinese funerals. Traditional writing instruments in China, India and other Asian cultures also are made of bamboo. Utensils - Bamboo is used for cooking and household utensils in many cultures and is marketed as an eco-friendly alternative to metal or plastic utensils. Cutting boards, trays, bowls, spoons, spatulas, brooms, whisks, ladles and many other kitchen utensils are made from bamboo. 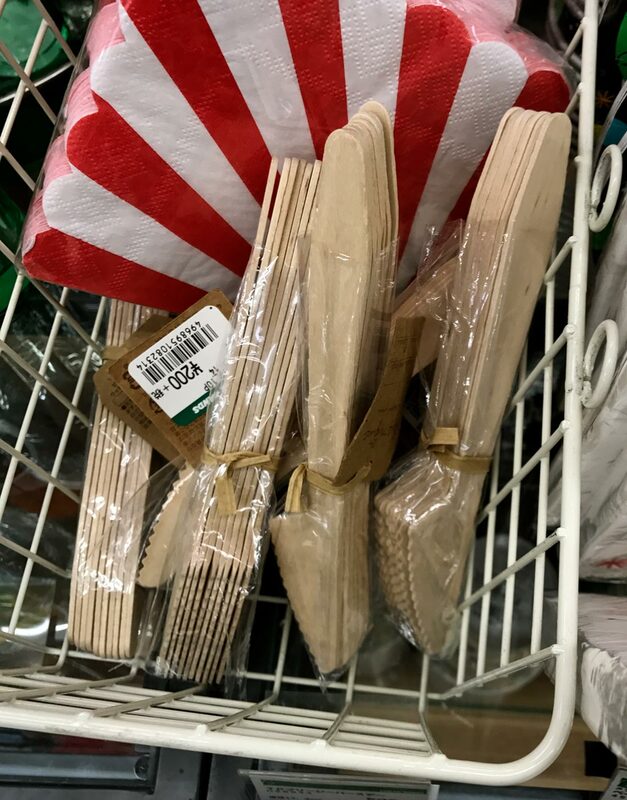 Bamboo is being used for children’s plates and silverware to allay parents' fears about plastic. Bamboo also is used to make disposable cutlery that biodegrades in 4-6 months. This type of product is steamed to make it malleable, eliminating worries about toxic chemicals in manufacturing. 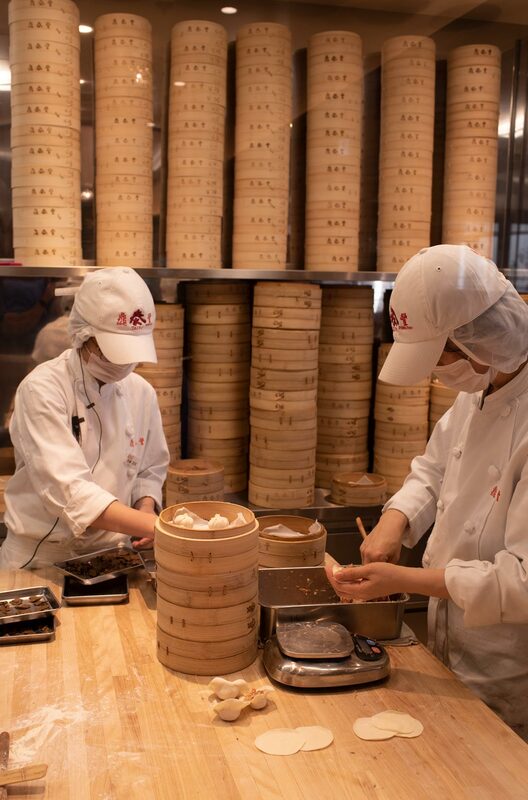 Steamed dumplings are made in bamboo steamers at the popular Asian restaurant Din Tai Feng. Disposable bamboo utensils for sale on Kappabashi Street, Tokyo, Japan. Photo by Tai Anderson. People in Asia dry clothes on bamboo rods and use bamboo ladders. Flagpoles, frames for umbrellas and fans, bird cages, toothbrushes and holders, combs, pitchforks, brooms, toys, snd mats are made from it. Bamboo furniture is created in a wide variety of cultures. Carpets are woven using bamboo implements. A bamboo goods store in central China. Among the most common ways to use bamboo and my personal favorite is baskets. I collect baskets everywhere I travel, especially ones made of bamboo. Bamboo baskets come in an endless variety of sizes, shapes and weaves, depending on their uses in the cultures in which they are made. Their use is so central to some cultures that they have become a symbol of prosperity and happiness and are considered the soul of a household. When a child is born in these cultures, it is placed in a bamboo basket. Bamboo baskets are a symbolic part of funeral rituals in some places. Bamboo baskets are used to winnow chaff from grain, dry grain and store all kinds of items. Ones made in standard sizes are used to measure quantities of grain in markets where crops from grain to dried fish and meat, chilis, spices, yarn and cloth are sold. A long bamboo tube is used to level off the grain at the top of a basket as it is measured..
Bamboo baskets are woven in very small sizes and in sizes so large they are used as boats. They are used widely for transporting items. In some areas, a woman’s dowry is measured by the number of baskets that it fills. Bamboo baskets are among the most beautiful and functional bamboo products. 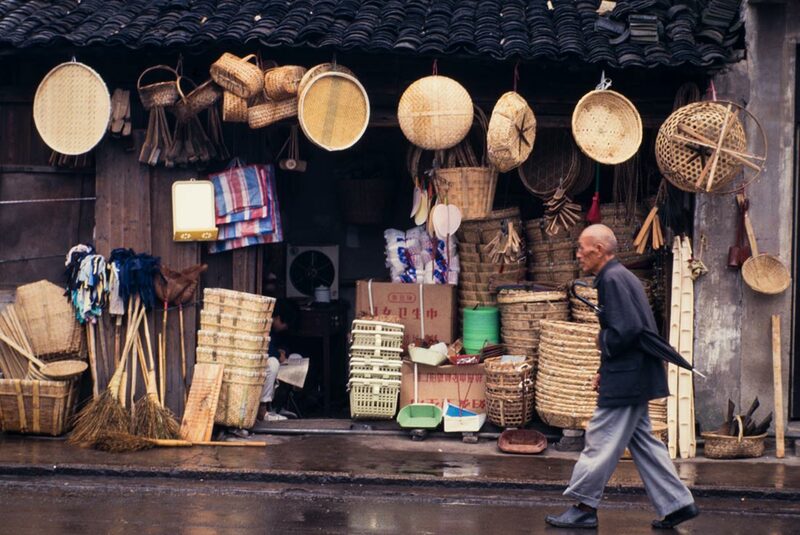 These baskets hold goods in a market in southern China. 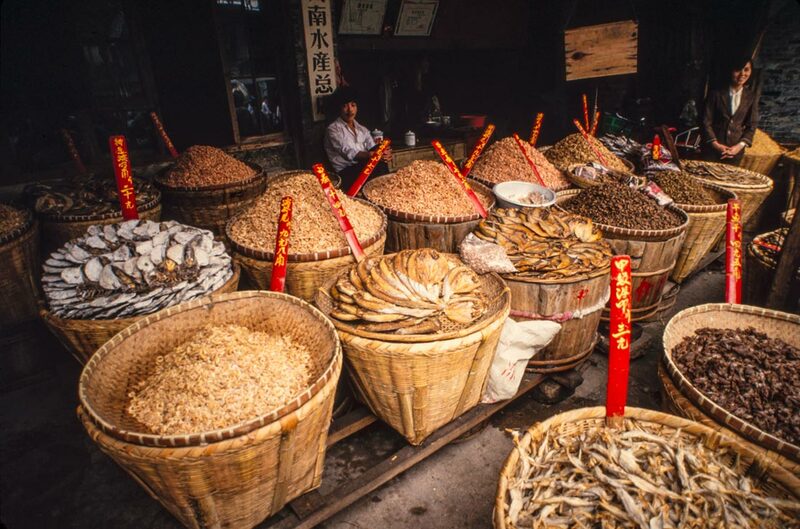 Equipment used for fishing and aquaculture such as fishing rods, traps, rafts and sails are created with bamboo. To make a bamboo raft, a hole is cut through a line of bamboo poles and a smaller bamboo pole is inserted through it to hold the poles together. Bamboo filters are used to remove salt from seawater. 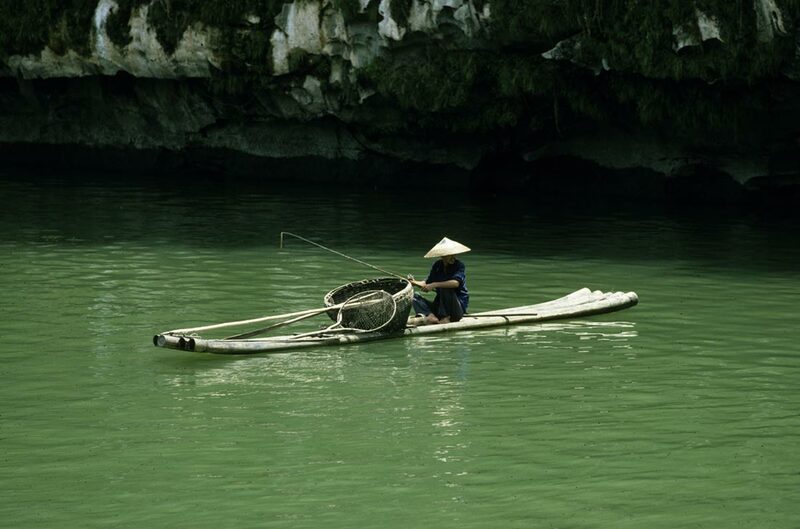 This fisherman on the Li River in China used a bamboo boat, bamboo fishing pole, and bamboo basket for his catch while wearing a bamboo hat to shade his head. Traditional flutes and other wind instruments are made with bamboo in various cultures. 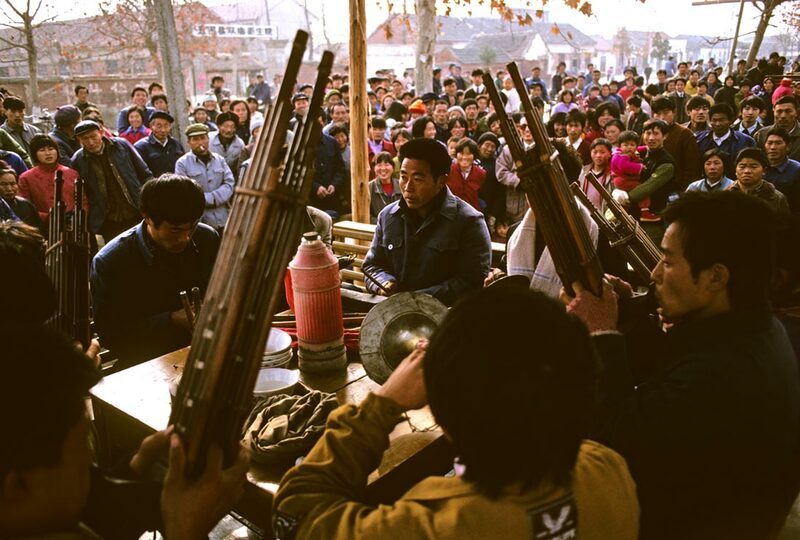 Musicians played traditional bamboo instruments at this rural funeral in central China in the 1990s. 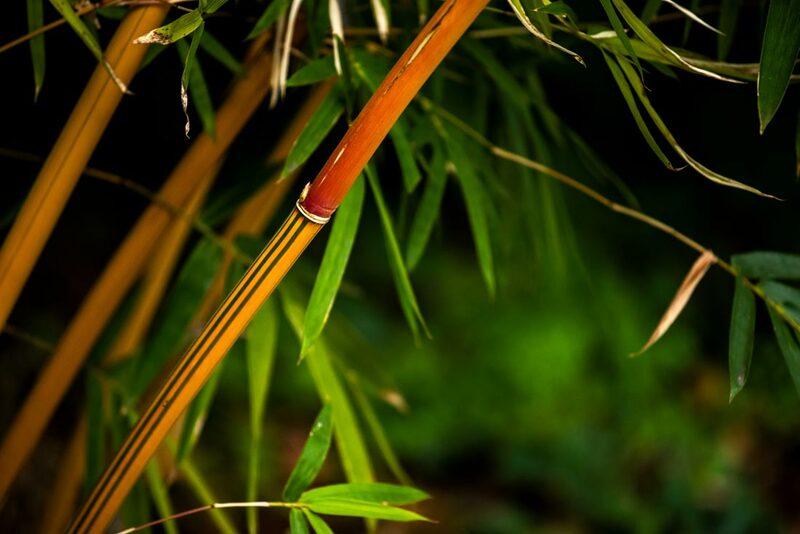 Bamboo once was widely used in weapon making, and still is used to make weapons for martial arts – sharpened bamboo staffs, swords, bows and arrows, and fire lances. Bamboo also has been used as a means of torture and punishment. Small explosive devices and firecrackers have been made with bamboo. 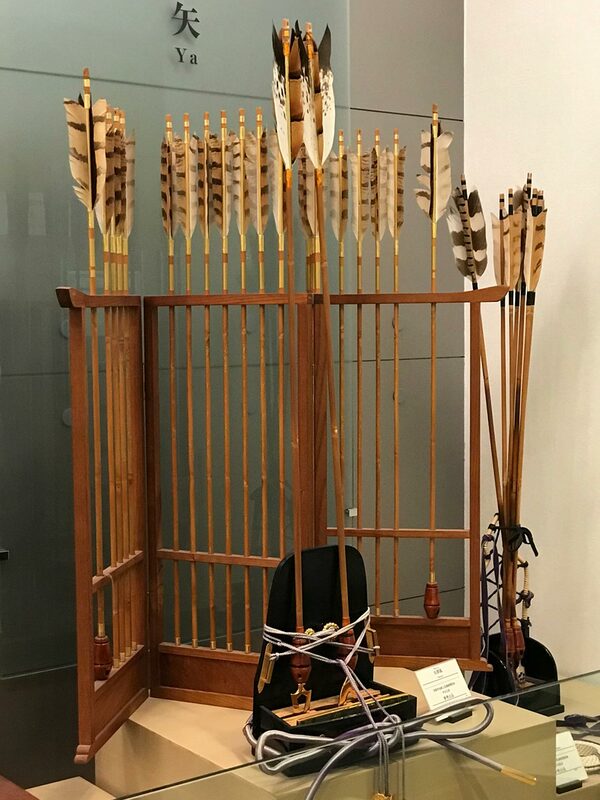 Bamboo arrows at a museum in Japan. 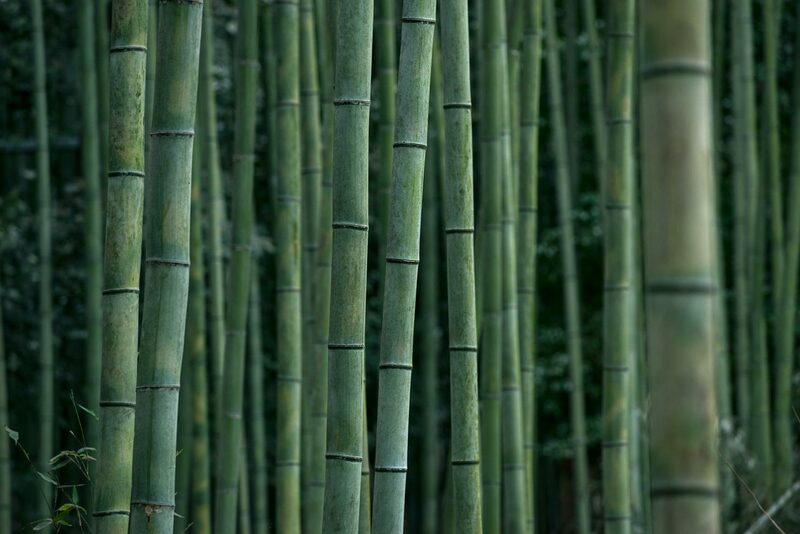 Bamboo is used to make bicycle frames, skateboards, surfboards and snowboards. 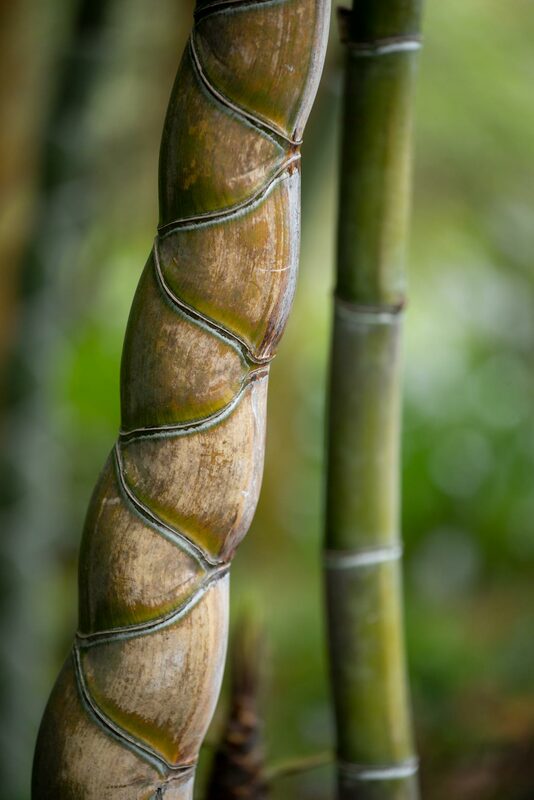 Silica produced in the joints of bamboo stems is an ingredient called tabasheer that is used in Asian medicine. Bamboo has been used as a fuel in China and Japan and also can be used as a biofuel. It is inexpensive in villages where bamboo is abundant and bamboo waste from workshops is available. Production of bamboo products can open up employment opportunities including growing bamboo, managing bamboo forests, transporting bamboo, pre-processing and processing it. In communities where bamboo grows prolifically, it can open opportunities to build local factories that can provide employment. Since bamboo grows from warm, moist tropical areas to cool mountainous ones across Asia, Australia, India, the Himalayas, sub-Saharan Africa, Argentina, Chile, the South American tropical rain forests, the Andes in Equador, Central America, Mexico and the southeastern United States, there is great potential for these community-based factories. The main obstacle to creation of this type of factories is training, as bamboo must be treated and dried properly to make it suitable for construction and also must be planted, harvested, transported, stored, used properly in construction and maintained to make it durable. In addition to Asia, bamboo is being grown commercially in Africa and the United States. Because of bamboo’s long life and perseverance under adverse conditions, it is a symbol of uprightness in China and of friendship in India. In China, bamboo, plum blossoms, orchids and chrysanthemums are referred to as the Four Gentlemen who represent the four seasons. Bamboo, pine and plum blossoms also are called the Three Friends of Winter in China. The Japanese have a ranking system which gives pine the first rank, bamboo the second and plum the third. Bamboo also is associated with integrity, elegance and plainness. In Japan, a bamboo forest sometimes surrounds a Shinto shrine as part of a sacred barrier against evil. Many Buddhist temples also have bamboo groves as do many villages. 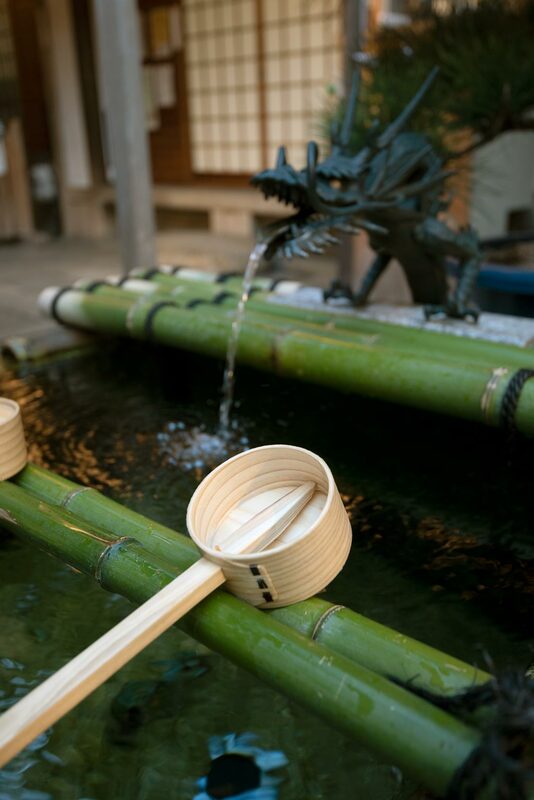 A bamboo ladle rests on a bamboo rack on a water basin at the Nishiki Tenmangu Shrine in Kyoto, Japan. Some Asian cultures believe that humanity sprang from a bamboo stem after a battle between the sky and ocean. Bamboo is considered an instrument of magic in many legends from all across the bamboo region of the world. Varieties of spotted bamboo figure in legends about tears falling on the bamboo. With global warming threatening the earth, bamboo is emerging as an environmentally friendly solution and one of the most sustainable and renewable resources. 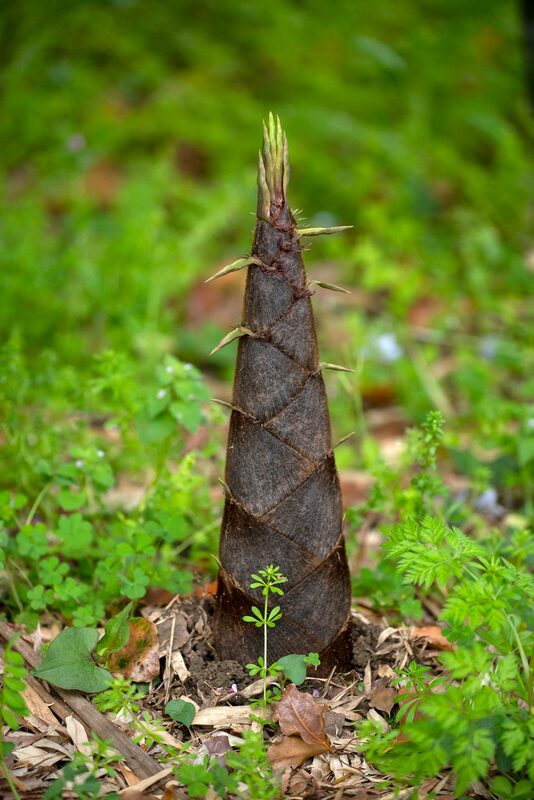 Because it rapidly self-propagates by shooting bamboo shoots up quickly after a harvest, harvesting bamboo avoids the problems of deforestation and erosion that wood has. It grows with no need for harmful pesticides and fertilizers and cleans the air by converting 33 percent more carbon dioxide into air than an equivalent stand of trees. It can be harvested from clumps raised on small pieces of land and its light weight means that it can be transported easily. Products made from it are biodegradable. On the down side, bamboo flooring, the most common manufacturing application of bamboo, is sometimes made with adhesives and formaldehyde that emit toxic VOCs. Some companies use non-formaldeyde adhesives, and consumers should look for bamboo flooring that has been certified by the Forestry Stewardship Council (FSC) to ensure its harvesting and manufacturing are environmentally responsible. Another problems with bamboo harvesting is that it has become common practice in some areas to cut existing trees and replace them with bamboo forests. Even though bamboo grows without fertilizers, some farmers are using environmentally damaging fertilizers, pesticides and weed killers to speed its growth. It is impossible in most cases for consumers to know whether a bamboo product has been harvested from a sustainable, harvestable crop with workers who earned fair wages in safe conditions. However, an increasing number of companies are raising harvesting and manufacturing standards to solve this problem. Donna Rouviere Anderson and Forrest Anderson are working on a photo-illustrated book on Japanese design that includes a section on bamboo's many uses.